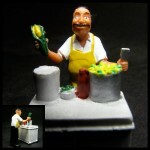 Little plastic characters from barrio life, check the Homies get as much flak as they get props. They were created by Mexican-American cartoonist David Gonzales, troche who clearly launched the collectible-toy phenomenon (120, patient 000,000+ figurines sold) from a place of respect. Maybe I’m just a stupid white guy, but this vendor’s face and stance seem to radiate the affection that was poured into his design. He was made in China, like the others, and I bought him in Chinatown – but I’m not even gonna try to unpack that. Seen elsewhere on HLO: “Chato”, the Homies pit bull.